Michio Tsutsui established the Technical Japanese Program (TJP) and directed it from 1990 until its closure in 2015. He received a BS in Naval Engineering from Osaka University, Japan, and worked several years for IBM Japan as a systems engineer. 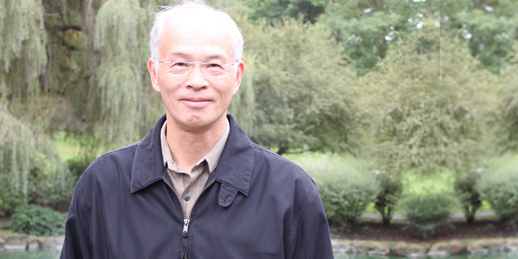 In 1984, Prof. Tsutsui earned a PhD in Linguistics from the University of Illinois in Urbana-Champaign. The next year he moved to MIT to set up the Japanese language program, which he directed until 1990. While at MIT, Prof. Tsutsui also participated in the establishment of the MIT Summer School in Technical Japanese for Computer Scientists and Electrical Engineers, where he taught for three years. Prof. Tsutsui is a national leader in technical Japanese. He has written a number of articles on technical Japanese and teaching Japanese to engineers and scientists, given numerous presentations on these topics at national and international conferences, and organized workshops to promote collaboration among programs and individuals engaged in or interested in teaching technical Japanese. Prof. Tsutsui has also been active in promoting the use of technology for foreign language learning. He has lead several CALL (Computer-Assisted Language Learning) projects at the University of Washington, including Language Partner and Language Evaluator, and has organized several workshops on this subject. Prof. Tsutsui's publications include A Dictionary of Basic Japanese Grammar, A Dictionary of Intermediate Japanese Grammar, A Dictionary of Advanced Japanese Grammar (co-authored with Seiichi Makino and published by The Japan Times), and Tobira: Gateway to Advanced Japanese; Learning Through Content and Multimedia (editorial supervisor and a coauthor; published by Kuroshio Shuppan). His research interests include Japanese linguistics, technology-enhanced language learning, teaching Japanese for special purposes, second language acquisition, and international technical communication. 1985-1990: Assistant Professor, Section of Foreign Languages and Literatures, Department of Humanities, M.I.T. Summer 1984: Professor-in-charge of First-year Intensive Japanese, Japanese School, Middlebury College, Vermont. * Tsutsui, M. (editorial supervisor and coauthor), E. Shoko, et al. (2012) Kore de Mi ni Tsuku Bunpoo-ryoku [Grammar Power: Exercises for Mastery]. Tokyo: Kuroshio-shuppan, 245 pp. * Oka, M., J. Kondo, M. Tsutsui, et al. (2011) Chuukyuu-nihongo o Oshieru Kyoooshi no Tebiki [Teaching Intermediate Japanese: Teacher’s Guide]. Tokyo: Kuroshio-shuppan, 230 pp. * Ishikawa, S., J. Kondo, M. Tsutsui, et al. (2010) Kitaeyoo Kanji-ryoku [Power up Your Kanji]. Tokyo: Kuroshio-shuppan, 332 pp. * Tsutsui, M. (editorial supervisor and coauthor), M. Oka et al. 2009. Jookyuu e no Tobira: Kontents to Maruchi-media de Manabu Nihongo [Tobira: Gateway to Advanced Japanese; Learning Through Content and Multimedia]. Tokyo: Kuroshio-shuppan, 424 pp. * Makino, S. and M. Tsutsui. 2008. A Dictionary of Advanced Japanese Grammar. Tokyo: The Japan Times, 846 pp. * Makino, S. and M. Tsutsui. 1995. A Dictionary of Intermediate Japanese Grammar. Tokyo: The Japan Times, 837 pp. * Makino, S. and M. Tsutsui. 1986. A Dictionary of Basic Japanese Grammar. Tokyo: The Japan Times, 465 pp. * Takami, Tomoko and M. Tsutsui (editorial supervisor) (2014) Chuukyuu kara Nobasu Keesu-sutadii de Manabu Nihongo [Powering up Your Japanese through Case Studies: Intermediate and Advanced Japanese], Tokyo: The Japan Times, 163 pp. * Tsutsui, M., O. Kamada, and W. Jacobsen (eds.) (2014) Nihongo-kyooiku no Atarashii Chihei o Hiraku [New Horizon in Japanese Language Education], Tokyo: Hitsuji-shobo, 260 pp. * Kamada, O., M. Tsutsui, Y.A. Hatasa, F. Nazkian, and M. Oka (eds.). 2005. Gengo to Kyooiku: Nihongo no Sekai [Language and Education: The World of Japanese Language]. Tokyo: Hitsuji-shobo, 25 + 450 pp. * Tsutsui, M. (2014). "Nihongo-kyooiku to daini-gengo-shuutoku paneru no sookatsu" [Discussion on some issues of Japanese language pedagogy and second language acquisition], In M. Tsutsui, O. Kamada, and W. Jacobsen (eds.) Nihongo-kyooiku no Atarashii Chihei o Hiraku [New Horizon in Japanese Language Education], Tokyo: Hitsujishobo, 147-153. * Tsutsui, M. 2005. "Rentai-shuushoku 'N1 no N2' no imi-kaishaku: Kaku-kaishaku no shiten kara [Interpretation of the Noun-modification Structure “N1 no N2”: From a Case Interpretation Perspective]" Gengo to Kyooiku: Nihongo no Sekai [Language and Education: The World of Japanese Language] (eds. by O. Kamada, M. Tsutsui, Y.A. Hatasa, F. Nazkian, and M. Oka) . Tokyo: Hitsuji-shobo, 35-48. * Tsutsui, M. 2004. "Nihongo-kyouiku ni okeru Hinshi Saikou" [Revisiting Parts of Speech in Japanese as a Second Language] Gengo to Kyouiku [Language and Education] (eds. by S. Koyama, K. Otomo, and M. Nohara), Tokyo: Kuroshio-shuppan, 205-227. * Tsutsui, M. 2002. "CALL Software for a Wide Range of Users: New Approaches to Development and Dissemination" (Part 1. Language Learning in the Network Society, Chapter 2). Learning Japanese in the Network Society (ed. K. Nakajima), Calgary, Canada: University of Calgary Press, 25-37. * Tsutsui, M. 2001. "Japanese for Special Purposes: Teaching Japanese to Engineers and Scientists" (Chapter 9) Advances in Japanese Pedagogy (ed. by Hiroshi Nara), Columbus, OH: National Foreign Language Center, Ohio State University, 281-313. * Tsutsui, M. 1990. "A Study of Demonstrative Adjectives before Anaphoric Nouns in Japanese." (Part 1. Japanese Language and Structure, Chapter D. Pragmatics and Discourse). On Japanese and How to Teach It: In Honor of Seiichi Makino (eds. by Jacobsen, Wesley and Osamu Kamada), Tokyo: The Japan Times, 121-135. * Tsutsui, M. (2012). "A Study of the Usage Restriction for Simultaneity Expressions in Japanese" Japanese Language and Literature, 46:1. 91-124. * Tsutsui, M. 2006. "The Japanese Copula Revisited: Is da a Copula?" Japanese Language and Literature, 40:1, 59-103. * Tsutsui, M. 2004. "Multimedia as a Means to Enhance Feedback" Computer Assisted Language Learning, 17:3-4, 377-402. * Haselkorn, M., G. Sauer, J. Turns, D. Illman, M. Tsutsui, C. Plumb, T. Williams, B. Kolko, and J. Spiridakis. 2003. "Expanding the Scope of Technical Communication: Examples from the Department of Technical Communication at the University of Washington" Technical Communication, 50:2, 174-191. * Tsutsui, M. 1999. "Amerika ni okeru Senmon-nihongo: Kako, Genzai, Mirai" [Japanese Education for Special Purposes in America: Past, Present, and Future] Journal of Technical Japanese Education, 1, 10-15. * Tsutsui, M., M. Kato, and B. Mohr. 1998. "Closing the Gap between Practice Environments and Reality: An Interactive Multimedia Program for Oral Communication Training in Japanese" (Part 1. Theory; Part 2. Practice) Computer Assisted Language Learning, 11:2, 125-151. * Tsutsui, M. 1994. "Curriculum Development for Technical Japanese: A Case in the US" Current Reports of Japanese Language Education around the Globe 1, 217-227. * Tsutsui, M. 1991. "Establishing Anaphoric Reference: A Contrastive Study of The and Wa" International Communications Studies 1:1, 197-218. * Tsutsui, M. 1989. "MIT ni okeru Kagakugijutsusha no tameno Jookyuu-nihongo Shuuchuukooza" [MIT's Intensive Program in Advanced Japanese for Scientists and Engineers] Nihongo Kyooiku 67, 216-227. * Tsutsui, M. 1984. "Wa no shooryaku" [Ellipsis of Wa] Gekkan Gengo 13:5, 112-121. * Tsutsui, M. 1983. "Ellipsis of Ga" Papers in Japanese Linguistics 9, 199-244. * Tsutsui, M. 1981. "Topic Marker Ellipsis in Japanese" Studies in Linguistic Sciences 11:1, 163-179. * Tsutsui, M. (2013). "Chuukyuu-bunpoo-kyoozai wa doo tsukurareru-beki ka" [How should intermediate-level grammar exercises be developed? ], The Proceedings of the 17th Japanese Language Symposium in Europe, 223-228. * Tsutsui, M. (2012). "Kyookasho to tekunorojii no toogoo: Jissen to kadai" [Integrating technology into a textbook: Implementation and accompanying challenges], The Proceedings of the 5th International Conference on Computer Assisted Systems For Teaching & Learning Japanese (CASTEL-J), 1-4. * Tsutsui, M., S. Watarai and Y. Sakakibara (2012). "Pawaa-pointo o tsukatta nihongo-kihon-bunpp no shuutoku-shien-kyoozai no kaihatsu: jissen to kadai" [Development of PowerPoint materials for learning basic Japanese grammar], The Proceedings of International Conference on Japanese Language Education (ICJLE) 2012, Nagoya, Japan, 309. * Tsutsui, M., S. Watarai and Y. Sakakibara (2012). "Nihongo kihon-bunpp-jiten ni junkyo shita CALL doriru-kyoozai no kaihatsu: Pairotto shiyoo-jikken no hookoku" [A report on an effectiveness and usability test of sample CALL drill materials], The Proceedings of the 2012 Princeton Japanese Pedagogy Forum, Princeton University, 122-133. * Tsutsui, M. and M. Oka (2008). "Eigo-ken-muke Chuukyuu-kooki-yoo Kyookasho no Kaihatsu: Jissen to Kadai" [Development of an Upper-Intermediate Level Japanese Textbook for English Speakers: Practice and Challenges], Proceedings of ICJLE 2008, Pusan University of Foreign Studies, Pusan, Korea, vol.3: 212-215. (ICJLE: International Conference on Japanese Language Education. * Tsutsui, M. 2004. "Error Analysis for Effective Delayed Feedback" The Proceedings of the 3rd International Symposium on OPI and the 12th Princeton Japanese Pedagogy Forum, Princeton University, Princeton, NJ, August, 2004. 66-74. * Tsutsui, M. 2002. "Koutou-sukiru-kyouiku no tame no Fiidobakku ni okeru CALL no Yuukousei" [Effectiveness of CALL in Providing Feedback for Teaching Oral Skills] Proceedings of CASTEL/J 2002: the Third International Conference on Japanese Language Teaching and Computer, 153-156. * Tsutsui, M. and M. Kato. 2001. "Designing a Multimedia Feedback Tool for Developing Oral Skills" CALL ? the Challenge of Change (ed. by K. Cameron), Exeter, UK: Elm Bank Publications, 81-88. * Tsutsui, M. 1999. "Current Computer Use in Japanese Language Education and Directions for the Future: The University of Washington's Case" CASTEL/J '99 Proceedings: The Second International Conference on Computer-Assisted Systems for Teaching and Learning Japanese, 12-17. * Tsutsui, M. 1999. "Foreign Language Skills for Engineering Students: A Study of English-Japanese Bilinguals" Proceedings of the 1999 American Society for Engineering Education Annual Conference [7 pp, CD-ROM]. * Tsutsui, M., M. Kato, and B. Mohr. 1999. "Expanding a Multimedia Application for a Wider Range of Users" CALL and the Learning Community. (ed. by K. Cameron). Exeter, UK: Elm Bank Publications, 435-441. * Tsutsui, M. 1998. "A New Approach to CALL Software Development: Software Expansion Involving Users" Proceedings of the 1998 WorldCALL Conference, 102-103. * Tsutsui, M., M. Kato, and B. Mohr. 1998. "Development of Nihongo Partner: Targeting Interactive Multimedia Technologies towards Training Oral Communication Skills in Japanese" Multimedia CALL: Theory and Practice (ed. by Keith Cameron) Exeter, UK: Elm Bank Publications, 273-279. * Tsutsui, M. 1997. "International Engineering Internships: Practices and Problems" Proceedings of the 1997 Mechanical Engineering Department Heads Conference: Mechanical Engineering Education for Global Practice, The American Society for Mechanical Engineers, 135-142. * Tsutsui, M. 1996. "Instruction and Evaluation Methods for the Second-year Technical Japanese Reading Class at the University of Washington" Proceedings of the Third International Symposium on Teaching Japanese for Engineering Students: Instruction and Evaluation of Reading Skills, University of Tsukuba, Japan, 253-261. * Tsutsui, M. 1996. "Meeting the Increasing Need for Internationally Trained Engineers: A Review of Technical Japanese Training in the US." Proceedings of the 1996 American Society for Engineering Education Annual Conference, [CD-ROM]. * Tsutsui, M. 1993. "Technical Translation or Technical Japanese?" Proceedings of the NTIS/JICST Conference on How to Locate and Acquire Japanese Scientific and Technical Information, 389-399. * Tsutsui, M. 1990. "Some Principles of Discourse Anaphora in Japanese" Papers from the Middlebury Conference on Japanese Linguistics and Japanese Language Teaching (ed. by Matsuo Soga), Middlebury College, Middlebury, VT, 198-212. * Tsutsui, M. 1981. "Ellipsis of Wa" Papers from the Middlebury Symposium on Japanese Discourse Analysis (ed. by Seiichi Makino), 295-319. * Tsutsui, M. 2005. "Nihongo-Kyooiku ni okeru Konpyuuta-Riyoo [Use of Computers for Japanese Language Education]" Nihongo-Kyoiku Jiten [Encyclopedia of Japanese Language Education] ed. by The Society for Japanese as a Foreign Language, Tokyo: Taishukan, 986. * Tsutsui, M. (ed.) 1997. Proceedings of the Workshop on Teaching Japanese for the 21st Century: Technical Japanese, Distance Language Learning, and Technology for Language Learning. Technical Japanese Program, University of Washington. * Mills, D., K. Otsubo, and M. Tsutsui. 1993. Ch. 8. Kongo no Tenboo to Kadai [Prospects and Problems to be Solved]. Report on the Research Project for the Development of Effective Teaching Materials and Methods for Building Reading Skills in Technical Japanese. The Ministry of Education's International Scientific Research Project (No. 03044026). * Tsutsui, M. 1992. "Amerika ni okeru Kagaku-gijutsu-nihongo no Genjoo" [The Present Status of Technical Japanese in the US.] Nihongo Kyooiku Nenkan, Vol. 3, Tokyo: ALC Press. * Language Partner Online (a web version of Language Partner), 2008. (with J. Kim). * Language Partner, ver.3 (multimedia conversation practice tool), 2000 (with M. Kato, B, Mohr, and J. Kim). * Language Evaluator, ver.1 (multimedia feedback tool for oral performance), 2003 (with M. Kato and J. Kim). “Gakushuusha no senmon-bunya o awaseta nihongo-kyooiku: Kagakugijutsu-kontentsu o toriireru koto no imi” [Japanese for Professional Purposes: The significance of integrating technical contents into Japanese courses], American Association of Teachers of Japanese (AATJ) Annual Conference, Sheraton Downtown Hotel, Chicago, March 2015. "Desu/da wa doo oshieru-beki ka" [How should desu/da be taught?] American Association of Teachers of Japanese (AATJ) Annual Conference, Philadelphia Marriott Downtown, Philadelphia, March 2014. "Chuukyuu-bunpoo-kyoozai wa doo tsukurareru-beki ka" [How should intermediate-level grammar exercises be developed? ], The 17th Symposium on Japanese Language Education in Europe, Universidad Complutense de Madrid, Spain, September 2013. "Meishi-ku ‘A no B’ wa doo oshieru-beki ka" [How should the noun phrase ‘A no B’ be taught?] American Association of Teachers of Japanese (AATJ) Annual Conference, Manchester Grand Hyatt Hotel, San Diego, March 2013. "Kyookasho to tekunorojii no toogoo: Jissen to kadai" [Integrating technology into a textbook: Implementation and accompanying challenges], 5th International Conference on Computer Assisted Systems for Teaching and Learning Japanese (CASTEL-J), Nagoya University of Foreign Studies, Japan, August 2012. "Pawaa-pointo o tsukatta nihongo-kihon-bunpp no shuutoku-shien-kyoozai no kaihatsu: jissen to kadai" [Development of PowerPoint materials for learning basic Japanese grammar] International Conference on Japanese Language Education (ICJLE) 2012, Nagoya University, Japan, August 2012. "Nihongo kihon-bunpp-jiten ni junkyo shita CALL doriru-kyoozai no kaihatsu: Pairotto shiyoo-jikken no hookoku" [A report on an effectiveness and usability test of sample CALL drill materials] (with S. Watarai and Y. Sakakibara), 2012 Princeton Japanese Pedagogy Forum, Princeton University, May 2012. "‘Ga hayai ka’ to ‘ya ina ya’ no shiyoo-seiyaku saikoo," [Revisiting the usage restriction for ga hayai ka and ya ina ya] American Association of Teachers of Japanese Annual Conference, Sheraton Centre Toronto Hotel, March 2012. "Nihongo-gakushuusha no tame no kiso-bunpoo jishuu-doriru no kaihatsu" [Development of self-learning materials for learners of basic Japanese grammar] (with S. Watarai and Y. Sakakibara), Association of Teachers of Japanese Annual Conference, University of Hawaii at Manoa, Honolulu, Hawaii, April 2011. "Japanese for technical and business professions: Curricula and syllabi," Symposium on Teaching Japanese for Professional Purposes, University of Pennsylvania, Philadelphia, March 2010. "Concept and special features of Tobira: Gateway to Advanced Japanese" (with Y. Hanai, S. Emori and S. Ishikawa), Association of Teachers of Japanese Annual Conference Evening Seminar, Philadelphia, March 2010. "Possibilities of Online Business Japanese Courses," Association for Asian Studies Annual Conference, Chicago, March 2009. "Bijinesu-nihongo: Genzai to Shoorai" [Business Japanese: Present and Future] (panel discussant), Association of Teachers of Japanese Annual Seminar, Chicago, March 2009. "Chuukyuu-kooki-yoo Kyookasho Tobira: Kaihatsu no Mokuteki, Kadai, Tenboo" [Tobira an Upper-Intermediate Level Japanese Textbook: Aims, Challenges and Outlook] (with M. Oka), CAJLE Annual Conference, The Japan Foundation, Toronto, Canada, August 2008. “DA wa doo oshieru-beki ka: DA no kinoo saikoo” [How should DA be taught? : Revisiting the functions of DA], CAJLE Annual Conference, The Japan Foundation, Toronto, Canada, August 2008. "Teaching adjectives, with a focus on no-adjectives and na-adjectives" [Keiyooshi no oshie-kata: No-keiyooshi to na-keiyooshi o chuushin ni], Association of Teachers of Japanese Annual Seminar, Atlanta, April 2008. "Reexamination of the Functions of Da and the Ways of Teaching It," Association of Teachers of Japanese Annual Seminar, Boston, March 2007. "Theoretical Merits of Multimedia Technology for Post-performance Feedback," CALICO 2004 Conference, Carnegie Mellon University, June 2004. "Koutou-sukiru-kyouiku no ta me no Fiidobakku ni okeru CALL no Yuukousei [Effectiveness of CALL in Providing Feedback for Teaching Oral Skills]," CASTEL/J 2002: the Third International Conference on Japanese Language Teaching and Computer, University of California at San Diego, La Jolla, CA, July 2002. "Designing a Multimedia Feedback Tool for Developing Oral Skills," (with M. Kato). Exeter CALL 2001, University of Exeter, UK, Sept. 2001. "Expanding a Multimedia Application for a Wider Range of Users," (with M. Kato). Exeter CALL '99, University of Exeter, UK, Sept. 1999. "A New Approach to CALL Software Development: Software Expansion Involving Users," The 1998 WorldCALL Conference, Melbourne, Australia, July 1998. "Nihongo Partner: Concept and Practice." New England Japanese Pedagogy Workshop, Wesleyan University, CT, June 1998. "Teaching Technical Japanese: Purposes and Content." Workshop on Teaching Technical Japanese, University of Washington, WA, June 1998. "Pedagogical Background." Workshop on Using Multimedia Technology for Language Teaching, University of Washington, WA, June 1998. "Development of Nihongo Partner: Targeting Interactive Multimedia Technologies towards Training Oral Communication Skills in Japanese," (with Masashi Kato) The 1997 Exeter International Conference on Multimedia CALL: Theory and Practice, Exeter, UK, September 1997. "International Engineering Internships: Practices and Problems," The 1997 Mechanical Engineering Department Heads Conference on Mechanical Engineering Education for Global Practice, The American Society for Mechanical Engineers, San Diego, CA, March 1997. "Instruction and Evaluation Methods for the Second-year Technical Japanese Reading Class at the University of Washington," The Third International Symposium on Teaching Japanese for Engineering Students: Instruction and Evaluation of Reading Skills, University of Tsukuba, Japan, October 1996. "Advanced Technical Japanese Courses at the University of Washington," Workshop on Teaching Japanese for the 21st Century: Technical Japanese, Distance Language Learning, and Technology for Language Learning, University of Washington, Seattle, WA, September 1996. "Meeting the Increasing Need for Internationally Trained Engineers: A Review of Technical Japanese Training in the US," American Society for Engineering Education Annual Conference, Washington, D.C., July 1996. "Two Programs for Engineers and Scientists at the University of Washington," The Fourth Annual NTIS/JICST Conference, Boston, MA, July 1994. "Technical Japanese Instruction for Engineering Students," The Association for Asian Studies Conference, Boston, MA, March 1994. "Keeping Abreast of Japanese Technology: Japanese Program for Professionals," The Association of Japanese Business Studies, Vancouver, British Columbia, Canada, January 1994. "A Kanji/Vocabulary Self-learning System, " ACTFL (American Council on the Teaching of Foreign Languages) Annual Meeting, San Antonio, TX, November 1993. "Articulation and the Washington State Curriculum Guidelines Project," (with Chris Brockett), ACTFL (American Council on the Teaching of Foreign Languages) Annual Meeting, San Antonio, TX, November 1993. "Technical Translation or Technical Japanese?" The NTIS/JICST Conference on How to Locate and Acquire Japanese Scientific & Technical Information, San Francisco, CA, March 1993. "A Computer-Assisted System for Teaching Technical Japanese," The East Asian Software Symposium, Georgetown University, Washington, D.C., March 1993. "Access to Japanese Technology: Technical Japanese Programs in the US" ASPAC (Association for Asian Studies on the Pacific Coast) Annual Meeting, California Polytechnic State University, San Luis Obispo, CA, June 1992. "The Technical Japanese Program at the University of Washington," The American Society of Civil Engineers (Seattle Section) and The National Association of Corrosion Engineers (Puget Sound Section) Annual Joint Meeting, Seattle, WA, February 1992. "Advanced Japanese Programs for Engineers and Scientists in the US," ACTFL (American Council on the Teaching of Foreign Languages) Annual Meeting, Washington, DC, November 1991. "Japanese for Special Purposes: Teaching Advanced Technical Japanese," The Symposium on Intermediate and Advanced Japanese Language Instruction, The Consortium for Language Teaching and Learning, Princeton University, NJ, November 1991. "Some Principles of Discourse Anaphora in Japanese," The Conference on Japanese Linguistics and Japanese Teaching, Middlebury College, Middlebury, VT, June 1990. "Integration of Culture into a Second Language Course: Fourth-term Japanese at MIT," (with Tomoko Graham), The New England Conference of the Association for Asian Studies, Smith College, Northampton, MA, October 1990. "A Study of Demonstrative Adjectives in Indirect Anaphora in Japanese, " The Association for Asian Studies Conference, Chicago, IL, April 1990. "Technical Japanese: Instructional Barriers—Overview," The New England Conference of the Association for Asian Studies, Harvard University, Cambridge, MA, October 1989. "The Present State of Teaching Japanese as a Foreign Language and Some Suggestions for Teachers of Japanese," The New England Workshop on Japanese Pedagogy, Connecticut College, New London, CT, August 1989. "Syllabi and Teaching Materials for the Earlier Stage of Intermediate Japanese," The New England Japanese Pedagogy Workshop, Connecticut College, New London, CT, August 1989. "Establishing Anaphoric Reference: A Study of The and Wa," The International Conference on Cross-Cultural Communication, San Antonio, TX, March 1989. "Grammar Introduction and Oral/Functional Learning in Intermediate Japanese," The New England Japanese Pedagogy Workshop, Wesleyan University, Middletown, CT, August 1988. "Some Notes on Reinforcement Effects in Language Learning, " The Conference on Innovations in Teaching Chinese and Japanese, The State University of New Jersey Rutgers, New Brunswick, NJ, March 1988. "Special Reading Course for Advanced Students" (with David O. Mills), The Association of Teachers of Japanese Seminar, San Francisco, CA, March 1988. "Bridging 1st- and 2nd-year Japanese," The New England Japanese Pedagogy Workshop, University of Massachusetts, Amherst, MA, August 1987. "Some Conditions for the Presence of Demonstrative Adjectives in Japanese Discourse," The Association for Asian Studies Conference, Boston, MA, April 1987. "The Roles of Sentence Grammar and Discourse Grammar in Elementary Japanese," The Midwest Conference on Asian Studies, University of Illinois, Urbana, IL, October 1986. "Testing and Evaluation" and "How to Teach No Desu," The New England Japanese Pedagogy Workshop, Harvard University, Cambridge, MA, August 1986. "Ellipsis of Ga," The Japanese Linguistics Session of the Association of Teachers of Japanese Conference, University of Chicago, IL, April 1982. "Ellipsis of Wa," The Middlebury Symposium on Japanese Discourse Analysis, Middlebury College, Middlebury, VT, July 1981. “Reexamining the Significance of Global Competitiveness for Japan, and How to Horn Your English Skills for Its Future,” Osaka University Distance Lecture Series: World Academics: Insights from American Universities. Delivered to Osaka University, Japan, from the Osaka University San Francisco Office, November 2015. <Keynote speech> “Daini-gengo to shite no nihongo no tame no gengogaku: mokuteki to hoohoo” [Linguistics for Japanese as a Second Language: Objectives and Methodology], The 26th Central Association of Teachers of Japanese Conference (CATJ 26), University of Michigan, October - November 2015. “How can you gain most from your research group at UW? --Research at U.S. universities: Systems, practices and considerations,” Global Scientists and Engineers Program, Tokyo Institute of Technology, given at University of Washington, February 2015. "Research at U.S. universities: Systems, practices, and how to prepare yourself," Global Scientists and Engineers Program, Tokyo Institute of Technology, given at University of Washington, February 2014. "Japan: Regaining Its Strength, the Significance of Global Communication, and English Skills," Osaka University Distance Lecture Series: World Academics: Insights from American Universities. Delivered to Osaka University, Japan, from the Osaka University San Francisco Office, October 2013. "Japan’s Future, Global Communication, and How to Improve Your English," Osaka University Distance Lecture Series: World Academics: Insights from American Universities. Delivered to Osaka University, Japan, from the Osaka University San Francisco Office, October 2012. "Communication in the global society and improving your English skills," Osaka University Distance Lecture Series: World Academics: Insights from American Universities. Delivered to Osaka University, Japan, from the Osaka University San Francisco Office, November 2011. "Communication in the global world and English," Osaka University Distance Lecture Series: World Academics: Insights from American Universities. Delivered to Osaka University, Japan, from the Osaka University San Francisco Office, November 2010. "Communication in the global world and English," Osaka University Distance Lecture Series: World Academics: Insights from American Universities. Delivered to Osaka University, Japan, from the Osaka University San Francisco Office, October 2009. <Keynote speech> "Gaikokugo-kyooiku ni okeru bunpoo-kyooiku no yakuwari" [The Role of Grammar Instruction in Foreign Language Education], Workshop on Teaching Japanese Grammar, The Association of Teachers of Japanese in Southern California and The Canadian Association for Japanese Language Education, Soka University of America, CA: Santa Anna, April 2009. "Technical communication in the global marketplace," Osaka University Distance Lecture Series: World Academics: Insights from American Universities. Delivered to Osaka University, Japan, from the Osaka University San Francisco Office, October 2008. "A Multimedia Tool for Enhanced Feedback on Oral Performance," Workshop on Technology for Language Learning, Department of Asian Languages and Literature, University of Washington, May 2008. "How to teach Japanese grammar to intermediate and advanced students" [Chuu-jookyuu-bunpoo o doo oshieru ka], Special seminar at the Association of Teachers of Japanese Annual Conference, Atlanta, April 2008. "Language Partner: An interactive multimedia application for oral skills development," Center for Japan Studies and Department of Asian Languages and Cultures, University of Michigan, February 2008. "Is there a copula in Japanese?" Asian Languages and Literature Colloquium, University of Washington, January 2008. "Developing second language oral proficiency and its evaluation and testing," Symposium on International Communication and Language Education, School of Languages and Communication, Kobe University, Japan, November 2007. <Keynote speech> "The Past, Present and Future of CALL: Responding to Challenges," CASTEL/J 2007 International Conference, Kapiolani Community College, HI, August 2007. "Online Japanese course for professionals: Business Japanese Online," Language Board Colloquium, University of Washington, June 2007. "Technical communication and international communication skills," Osaka University Distance Lecture Series: World Academics: Insights from American Universities. Delivered to Osaka University, Japan, from the Osaka University San Francisco Office, October 2007. "Rikookei-gakusei no gogaku-kyooiku o kangaeru" [Language Education for Students of Science and Engineering], The Third Kwansei Gakuin English Forum, Kwansei Gakuin University, Hyogo, Japan, February 2007. "Technical communication and international communication skills" Osaka University Distance Lecture Series: “World Academics: Insights from American Universities." Delivered to Osaka University, Japan, from the Osaka University San Francisco Office, October 2006. "Tekunikaru-komyunikeeshon-kyooiku: Washington-daigaku ni okeru torikumi" [TC Education at UW], Symposium on Creative Education (Co-sponsored by Osaka University’s School of Engineering and the Ministry of Education, Culture, Science and Technology), Osaka University, Japan, March 2006. "Study Abroad and Internships for Business Language Students," 2005 CIBER Business Language Conference (co-sponsored by 27 national CIBER centers), Park City, UT, April 2005. "Maruchimedia o riyooshita kootoo-pafoomansu no han’yoo hyooka-shisutemu" [A General-purpose Oral Performance Evaluation System Using Multimedia Technology], 18th International Student Center Colloquium (co-sponsored by the International Student Center and the International Communication Center), Kobe University, Japan, February 2005. "Maruchimedia no gengo-kyooiku e no ooyoo" [An Application of Multimedia to Language Education], National Institute for Multimedia Education, Chiba, Japan, February 2005. "Interactive CALL: Development and Practice," Faculty of Foreign Languages, Himeji-dokkyo University, Himeji, Japan. June 2001. "Integration of Multimedia CALL into Language Classes" Division of Languages, International Christian University, Tokyo, Japan, June 2001. Keynote speech for the Session: Language Education in Specialized Fields for International Students: "Technical Japanese Education in the US and Specialized Japanese Education in the 21st Century," International Symposium on Research and Education in the 21st Century, Tohoku University, Sendai, Japan, August 2000. Keynote speech: "The Use of Technology for Japanese Language Instruction: An Application of Multimedia Technology and Its Implications," The 8th Princeton Japanese Pedagogy Workshop, Princeton University, Princeton, NJ, May 13, 2000. "A Language Learning Software Program using Multimedia Technology: Theory and Practice," School of Business Administration, Meiji University, Tokyo, Japan, July 2000. Keynote speech: "Current Computer Use in Japanese Language Education and Directions for the Future," The Second International Conference on Computer-Assisted Systems for Teaching and Learning Japanese, University of Toronto, Canada, August 1999. Principal Investigator, "Japanese Program for Professional Scientists, Engineers, and Managers" (Round 2), The Air Force Office of Scientific Research, $1,230,000. Principal Investigator, "Japanese Program for Professional Scientists, Engineers, and Managers" The Air Force Office of Scientific Research, $1,500,000. Salary Assistance Program for Full-time Japanese Language Teachers, The Japan Foundation, $58,000. Principal Investigator, "Development of a Japanese Interactive Video Program for Aural Comprehension," The Consortium for Language Teaching and Learning, $6,300. Investigator (Principal Investigator: Stephan Keiser, The University of Tsukuba), "Development of the System for Teaching and Evaluating Reading Skills in Scientific and Technical Japanese," The Ministry of Science, Education, and Culture, Japan, ¥10,200,000. Investigator (Principal Investigator: Kazuo Otsubo, The University of Tsukuba), "Analysis of Japanese Teaching Behavior and Learning Processes in Different Cultural Areas and Its Optimization of Teaching Materials," The Ministry of Education, Japan, ¥14,000,000. Investigator (Principal Investigator: Kazuo Otsubo, The University of Tsukuba), "Development of Effective Teaching Materials and Methods for Building Reading Skills in Technical Japanese," The Ministry of Education, Japan, ¥13,500,000. Investigator (Principal Investigator: Richard Samuels, MIT), "Development of Japanese Language Skills of Scientists and Engineers in the United States," National Science Foundation, $210,000. - Advisor, Planning Committee, Princeton Japanese Pedagogy Forum with special roundtables in honor of Prof. Makino’s retirement, Princeton University, September 2010 - May 2012. - Conference Committee member, 2011 Association of Teachers of Japanese Annual Conference, University of Hawaii at Manoa, Honolulu, HI, April 2011. - Workshop Organizer, Workshop on Using Multimedia Technology for Language Teaching, Seattle, WA, University of Washington, June 1998. - Workshop Organizer, Workshop on Teaching Technical Japanese, University of Washington, Seattle, WA, June 1998. - Lecture Seriese Organizer, International Technical Communication Lecture Seriese, University of Washington, Seattle, WA, Spring 1997 - Winter 1998. - Conference Co-organizer, International Conference on US-Asia Collaboration: Agility in Aerospace Manufacturing, Sheraton Hotel, Seattle, WA, October 22-23, 1997 (with The University of Texas at Austin). - Workshop Organizer, Workshop on Nihongo Partner and NP Author, University of Washington, Seattle, WA, January 17, 1998. - Workshop Organizer, Workshop on Teaching Japanese for the 21st Century: Technical Japanese, Distance Language Learning, and Technology for Language Learning, University of Washington, Seattle, WA, September 1996. - Workshop Organizer, Workshop on Teaching Technical Japanese, University of Washington, Seattle, WA, September 1994. - Donald E. Petersen Professor, University of Washington, 1990-present. - Member of the Board of Directors, the Association of Teachers of Japanese, 1990 - 1993 and 2009 - 2012. - M.I.T Old Dominion Fellowship, 1990-1991 (declined to accept a job offer). - IBM Japan Systems Engineering Award. 1974.